Right now we are selling the complete system as described with EVERYTHING included. We are proud to sell the top of the line OWS Windmill Aeration System. This system provides a continuous supply of oxygen to your water source. Some natural aeration is produced by surface wind, which aerates only the top layer of water. Below the surface, the water stratifies and becomes choked. When left unconditioned, the deep water develops quality problems. This system releases air into the bottom of the pond and ensures aeration throughout the entire volume of water. Coupled with the surface wind, the water supply is circulated to maintain its healthy state. 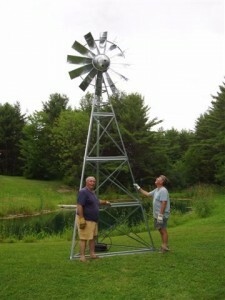 The Windmill is simple with few moving parts and has no gears! It’s efficient and very easy to maintain. 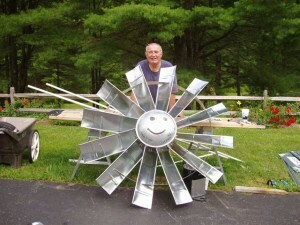 The basic design has 12 galvanized blades to catch the wind and turn the crankshaft. This pushes the HUGE diaphragm (bigger diaphragm, more air) which acts like a piston, forcing air out on the down stroke at 3.5 CFM and 30 PSI of air. It’s inexpensive and does a wonderful job of pond aeration. 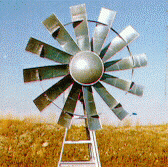 *The “windmill only” doesn’t have ANY tower or pumping parts, only the windmill gear box, blades and the tail etc. We also have extended the manufactures 5 year warranty to a FULL 10 years warranty. Let me know if you need more information on this wonderful product. Click on the pictures for a bigger view. It’s a 3 leg tower and YES it has a tail. Mr. Al Wright couldn’t be happier with his 16′ windmill. 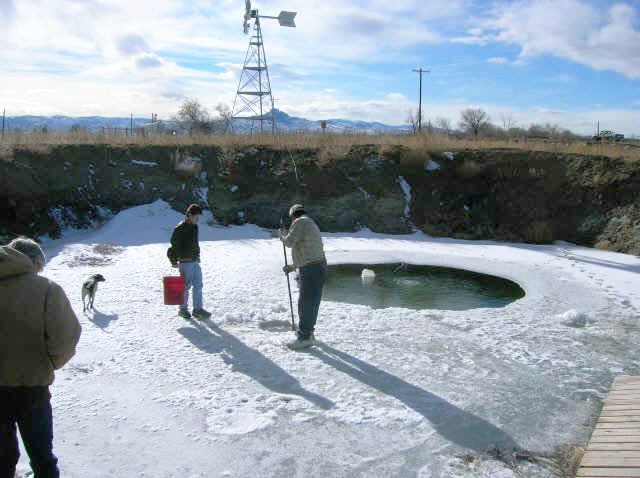 Look how the windmill keeps the frozen pond open.